Rev. 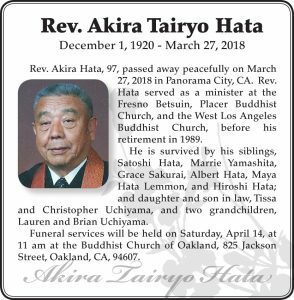 Akira Hata, 97, passed away peacefully on March 27, 2018 in Panorama City, CA. Rev. 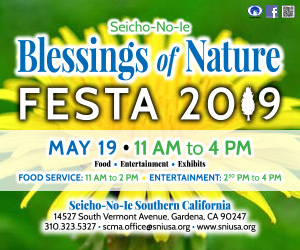 Hata served as a minister at the Fresno Betsuin, Placer Buddhist Church, and the West Los Angeles Buddhist Church, before his retirement in 1989. He is survived by his siblings, Satoshi Hata, Marrie Yamashita, Grace Sakurai, Albert Hata, Maya Hata Lemmon, and Hiroshi Hata; and daughter and son in law, Tissa and Christopher Uchiyama, and two grandchildren, Lauren and Brian Uchiyama. Funeral services will be held on Saturday, April 14, at 11 am at the Buddhist Church of Oakland, 825 Jackson Street, Oakland, CA, 94607.